The other day we were listening to a podcast where the host interviewed a chef and they mentioned Chicken Tinga. I love the way that sounds! Now, I don’t think I’ve ever made Chicken Tinga. I’ve seen it at fiestas especially during Cinco de Mayo or Mexican Independence Day festivities, and also while in Cuernavaca, Mexico with street vendors. It’s a simple recipe. The chipotles in adobo sauce lend their smoky flavor and heat to this remarkably simple shredded chicken dish. 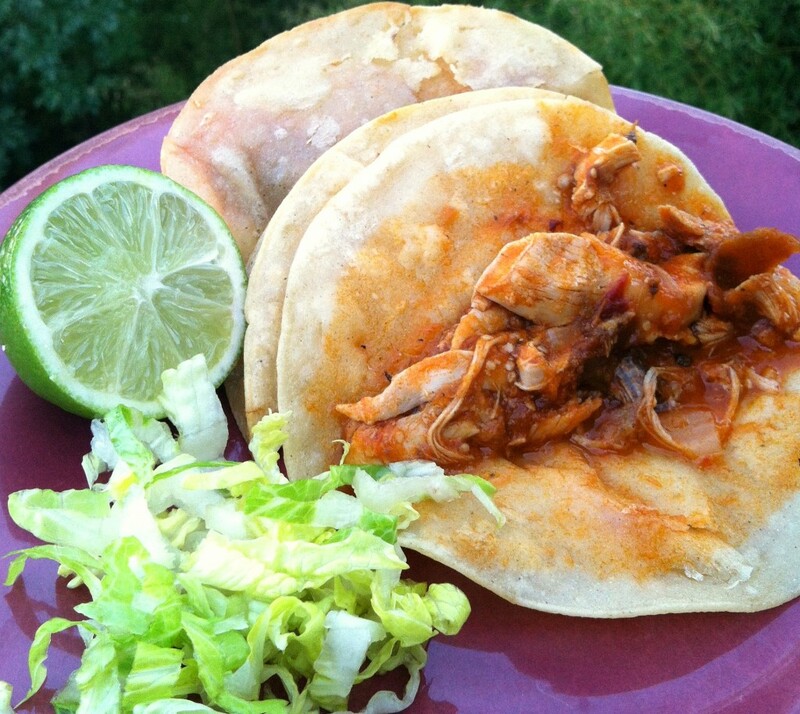 Serve the Chicken Tinga hot on a tostada, in a taco like we did or in a torta. Actually I may try it alone over some cilantro white rice next time. 1. Place the tomatoes and tomatillos in a 3-quart saucepan and cover with water. Bring to a simmer over medium-high heat, and cook further for about 8 to 10 minutes, or until the tomatoes and tomatillos are thoroughly cooked and slightly mushy, but not coming apart. Remove with a slotted spoon and place in a blender or food processor. Allow to cool slightly and then blend until smooth. 2. Heat the oil in a large 12-inch skillet over medium heat. Stir in the onion and sweat until softened and translucent, 4 to 5 minutes. Add the garlic and cook until it becomes fragrant and begins to lightly brown, less than a minute. Careful not to burn the garlic. 3. Carefully pour the pureed tomato-tomatillo sauce into the skillet with the onions. Stir in the oregano, marjoram, thyme, salt, and black pepper. Add chipotle chile and the reserved adobo sauce. Continue to simmer the sauce, stirring occasionally, until it deepens in color and thickens, about 10 to 12 minutes. If you’re worried about the sauce splattering, partially cover the skillet with a lid as it cooks. 4. Add the chicken and the chicken broth to the sauce and toss over the heat until it’s evenly coated. 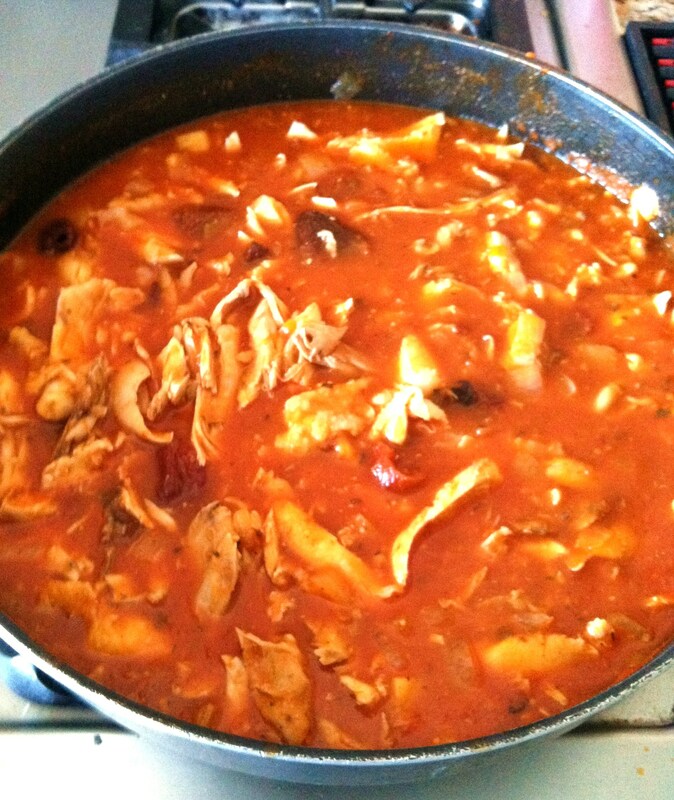 Allow to cook, stirring occasionally, until the chicken has absorbed most of the sauce, 6 to 8 minutes more. Let the Chicken Tinga simmer over a medium heat until most of the sauce is absorbed into the shredded chicken.